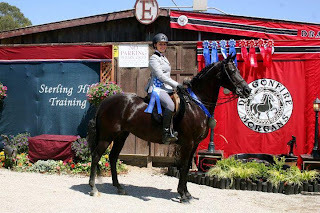 Located in sunny Santa Barbara, the Morgan Medallion Classic has always drawn world class Morgan competitors to the Earl Warren Fairgrounds where the ocean breeze keeps you cool in those hot show clothes. If the weather isn't enough to get you down there, the town certainly will, with the best fish tacos in the land. This year's show was improved greatly by a new schedule that allowed you to sleep in and then offered a long break in the show during the afternoon. 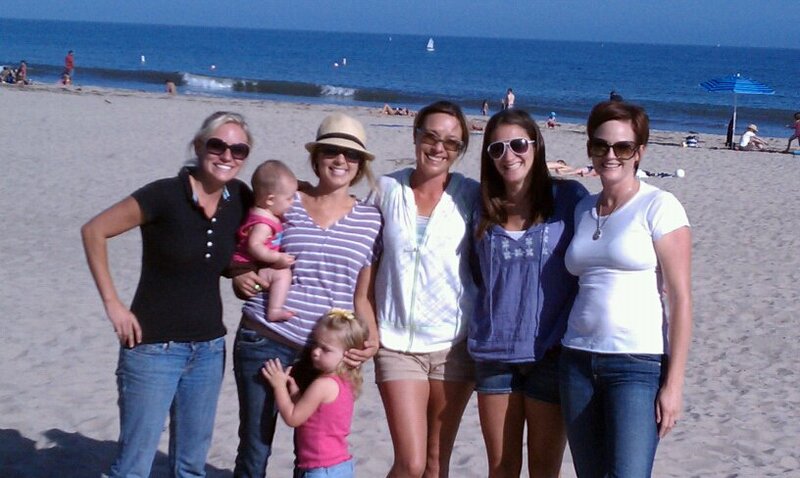 Dragonfire really took advantage of the gorgeous afternoons and spent every one of them at THE BEACH visiting with friends and clients new and old!! When we weren't enjoying ourselves in the sand, we were having an absolutely fantastic show at the fairgrounds. 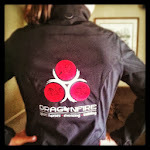 Dragonfire is blessed with a show string filled with depth and quality, a staff that knows how to hustle, and great riders and owners. This combination isn't easy to come by, and we are eternally grateful for it. 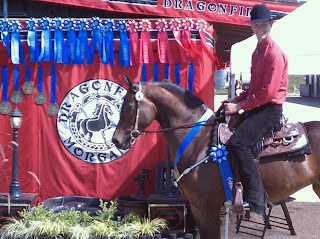 Earl McFall and Whitegold Rags to Riches had a wildly successful show, winning six out of seven classes. Out of his four Over Fences classes he won three and was second in the last with his quiet and relaxed style. 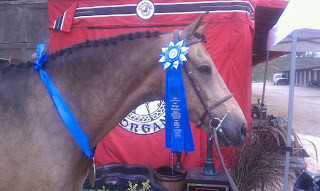 He then continued on to be undefeated in the Dressage and was the High Scoring Dressage Horse with a 74.4%. What a class act this big and handsome fellow is. 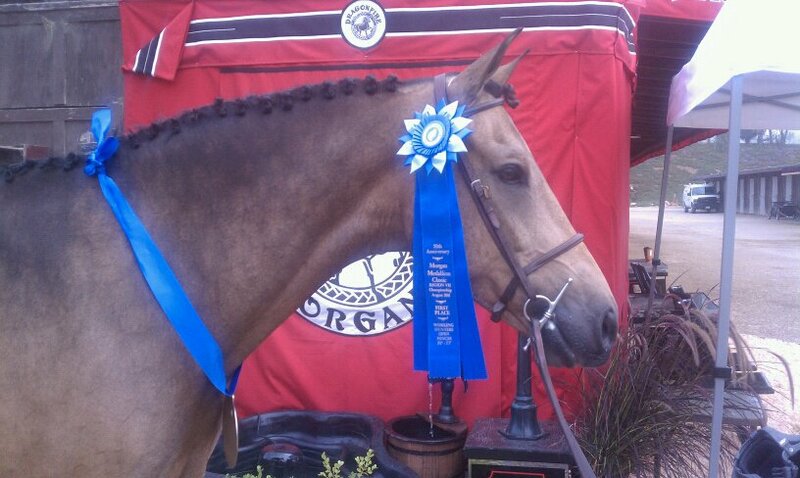 Owner Bonnie Bowers is seriously overrun with awards from this buckskin beauty! Michael and Melissa Votaw's extreme beauty, Miss Ruby Slippers, went undefeated with Jennifer McFall riding. 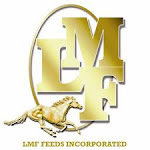 This mare has the grace and finesse of a much more seasoned competitor, and with these great qualities combined with her looks and soft movement, Ruby won both the Four and Under Western Pleasure and the Junior Western Pleasure Championship. Switching careers, French Flambeau turned some heads and gave two fantastic performances his first time out as a Hunter. 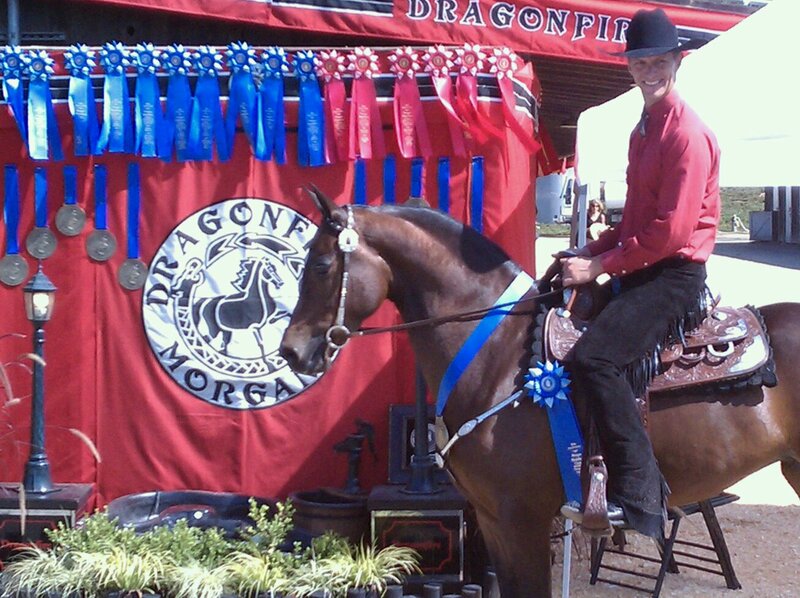 Presented by Jennifer McFall and owned by Tom and Stephanie Connor, Flambeau loves to show and is simply a joy to ride. 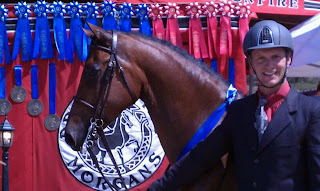 His willing and happy attitude, paired with a motivated engine, gave him the advantage for the win in the Novice Hunter Pleasure as well as the Reserve Championship in the Open Hunter Pleasure. Great things are certainly ahead for him! Caroline Dein continues to heat things up in the Junior Exhibitor Hunter Pleasure with Toni Casados' mare, Dragonfire Nefertiti. 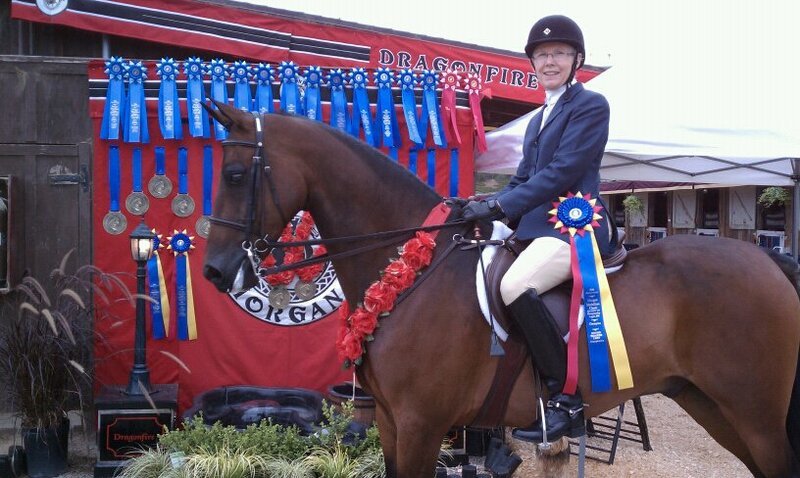 Although Caroline is new to the Morgan World, her experience as a Three Day Event rider makes her great in the show ring. And of course "Faye" knows her stuff in the show ring, being a many time Champion in both Ladies and Open Hunter Pleasure including wins in the OKC Coliseum. The pairing of these two has been nothing short of magical, with an undefeated record on the West Coast. Adding to their Region 8 Championship from Far West, Caroline and Nefertiti came away with the Region 7 Championship in Santa Barbara as well. 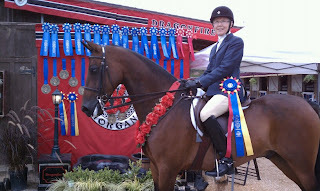 Barbara Fleming joined in on the winning and brought home her own set of roses riding Alias to the Limit Hunter Pleasure Championship. 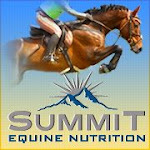 This is a great partnership that spans over several years now and includes Dressage and avid trail riding, as well as making victory passes in the show. 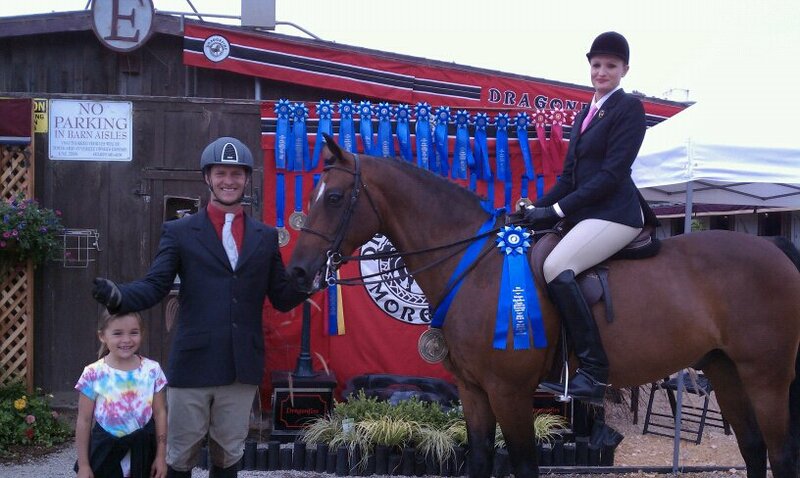 Barbara and Alias also trotted away with the win in the Amateur Masters Hunter Pleasure. 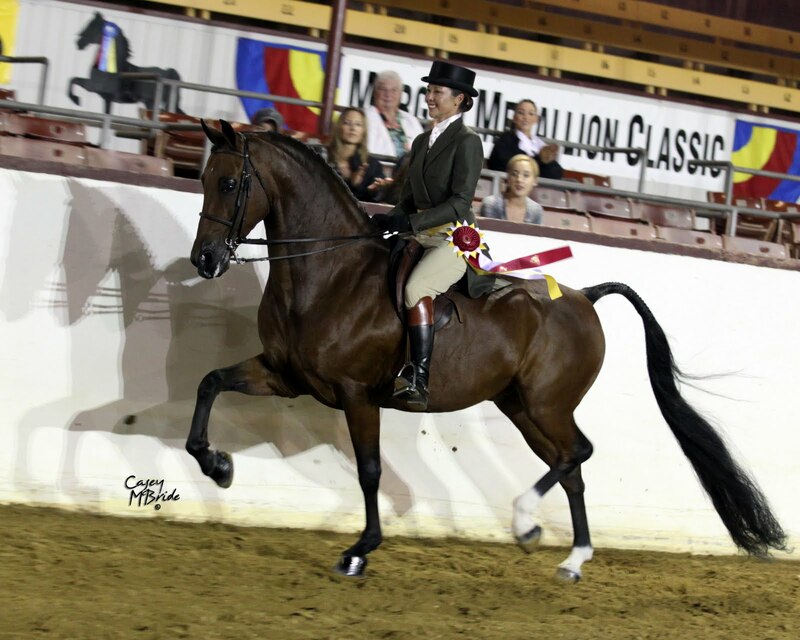 Art In Motion is a promising young sport horse with a bright career ahead of him. Along with his owner/rider, Natalie Jensen, "Spencer" showed his talent over fences at the Morgan Medallion. 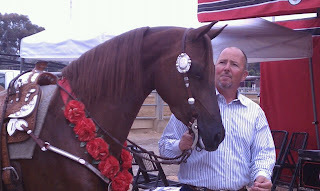 With a few seconds under their belt to start with, this team went head on with trainer, Earl McFall, and won their final class with gusto, leaving Earl with his only red ribbon of the show with Whitegold Rags to Riches. ALB Morgans has just recently established it's breeding program, and is already meeting great success with it's first youngsters in performance. Lovey of Stilwell has the makings of a first class western pleasure horse, with her strong type and conformation and her ability to easily hold herself together. She collected the Three Year Old Western Pleasure win at Medallion, to go along with her Far West Reserve Championship in the Junior Horse division. The Merriewold Morgans are known for their top class Sport Horses in the Morgan World. Adding to their show repertoire, Merriewold JS Bach has been a very consistent winner on the West Coast in the Hunter Pleasure division and is securing his breeder as show performance producer as well. 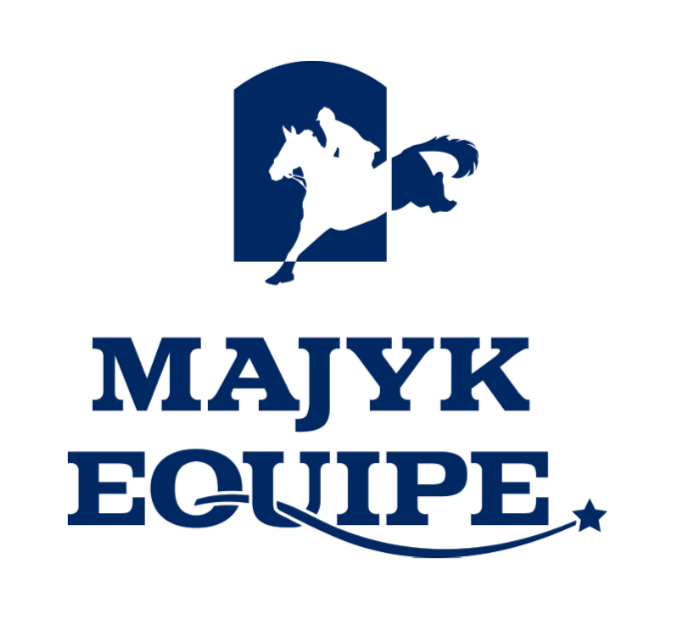 With wins at all three shows he has attended this season, including the Limit Hunter Pleasure at Medallion, JS is a four year old to keep your eye on. Macey McCallion has to be one of the most elegant looking riders on the scene. Not only that, she has the prowess of a jungle cat in the ring, calculating to the end. 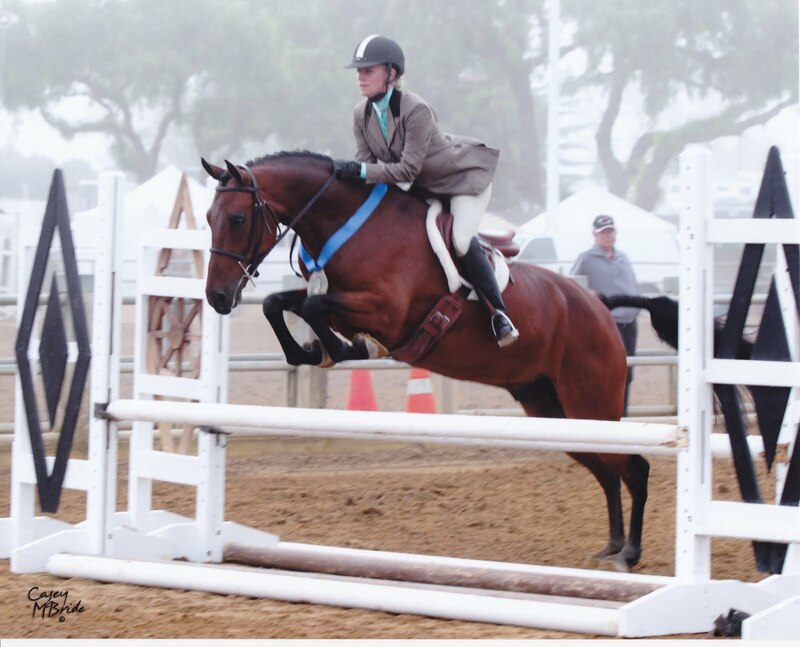 She and her long time partner, Chehalem Cassanova were at the top of the judge's card all week, with a win in the Pro/Am Hunter Pleasure along with trainer, Earl McFall. These three (Cass, too) are all so professional, and it is a great match having Macey and Earl show together since they are both extremely long and lean! The stirrup length didn't even need to be adjusted. We have to mention that this was the 50th Anniversary of the Morgan Medallion and the show staff did a bang up job making it special. It was wonderful seeing all of the old pictures of past winners, receiving the awesome goodie bags with lots of swag, and having the classes sponsored for "blasts from the past". It was especially wonderful to me, as I have been an exhibitor for twenty seven years uninterupted. Ahhhh..... Santa Barbara... we love you and can't wait to return!